Product prices and availability are accurate as of 2019-04-19 18:45:36 UTC and are subject to change. Any price and availability information displayed on http://www.amazon.com/ at the time of purchase will apply to the purchase of this product. 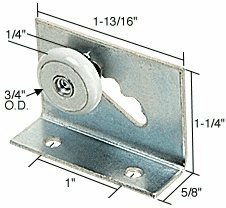 This CRL Sliding Shower Door Roller Assembly features a 3/4 inch (19.1 millimeter) oval edge nylon wheel. The aluminum bracket is 5/8 inch (15.9 millimeter) wide and has a ridged screw slot which allows for adjustment.